Glam Affair – Aria | Oh Look! It's A Blog! Glam Affair has a brand new skin that will be available at The Arcade on March 1st 2014 – Aria. 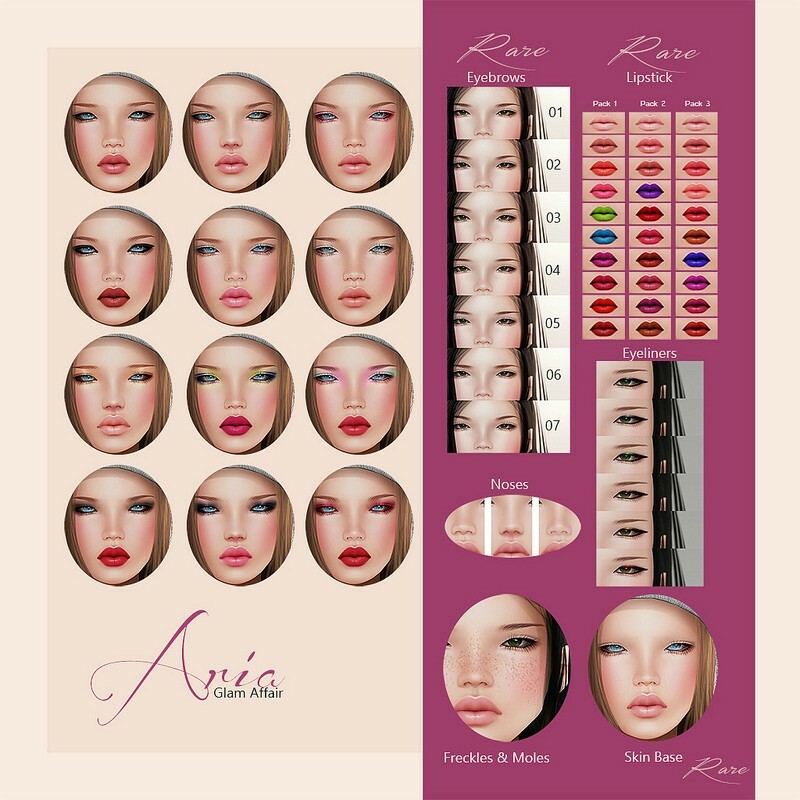 It will be available only in the Asia skin tone but appliers are included! It’s crazy how different combinations of parts can make me look so different even using the same shape for each photo. In addition to those 12 makeup/combos there is a bare face with no brows ( I like to think of it as a blank canvas ) that is perfect for all the add-on options you can win. You can see the lipsticks here ( on Aida’s Flickr ) as well as some of the additional add-ons like freckles/moles and all the different eyebrow options. Some other things not shown are eye circles, face light options ( added highlights to the face), eyeliners, lashes and lip glosses. There really are TONS of options which offers you the ability to create your very own unique face. I used several different tattoo options above, such as the Cosmo lips, nose #2 and a lash add-on and as you can see I look much different from the other combo skins. I love the option to “build your own face” lol. Here is the official ad for the Aria gacha so you can see what is rare ( eyebrows, lipsticks & skin base ) and pick out your favorites! The Arcade will open March 1st 2014 – Keep your eyes out for the shopping guide which will show all the items available – but for now you can check out the line up on the official website: March 2014 – Arcade Line-Up. This entry was posted in iheartslFeed, Uncategorized and tagged 2014, Arcade, ARIA, blog, Blueberry, C88, Clawtooth, Collabor88, Cute Poison, Gacha, Glam Affair, Hair, IKON, ISON, Letis, Letis Tattoo, Magika, March 2014, Mesh, Pink, Second Life, Skin, SL, The Arcade, Truth, Truth Hair. Bookmark the permalink.